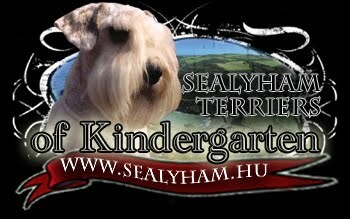 Sealyham Terrier of Kindergarten Bronzkoszorús Mestertenyészet: Happy Valentin's Day! The Gaeloway / Kindergarten Kennels proudly presents three girls and two boys out of Willow of Kindergarten X Bushaway Back to Back!!! Both parents PLL Clear! Champion címet elért kutyák 1996-2012 ig.